Rumor mills around HTC U ocean has slowly gained steam and is now churning out leaks at a faster rate. Even though we have already seen numerous leaks around HTC U code named Ocean including an alleged Render of the device and listing on Antutu Benchmarks revealing some of the technical specifications of the device. HTC U is rumored to sport a Quad HD display with a resolution of 1440 x 2560 pixels, powered by Qualcomm Snapdragon 835 processor along with Adreno 540 GPU and 4 GB of RAM. It comes with 64 GB of internal storage and runs on Android 7.1.1 Nougat based operating system. In terms of camera, it features a 16 MP main rear camera and another 12 MP front shooter for selfies. HTC U ocean is rumored to come with some unique features known as Edge Sense — the frame-embedded sensors that enable the user to control numerous, customizable actions with gestures such as squeezing or swiping along its left and right sides. Today, Androidheadlines reports a new leak which confirms some of the earlier rumored specifications & features along with providing some additional information. 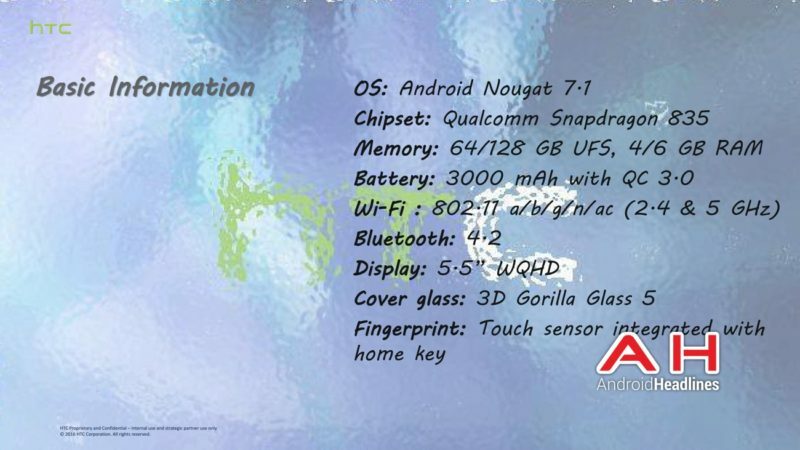 As per the leak, HTC U Ocean sports a 5.5 inch WQHD protected by Gorilla Glass 5 and may come in two RAM variants of 4 GB and 6 GB, while having two variations in internal storage of 64 GB and 128 GB. The report though also suggest that HTC may only launch a single RAM variant or different RAM variant for different international markets. 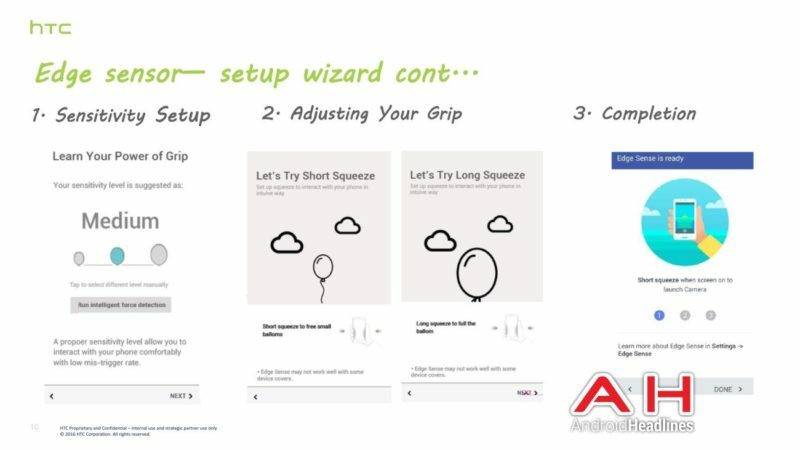 The device may be backed by a 3,000 mAh variant along with support for Qualcomm quick Charge 3.0. The fingerprint sensor is integrated with the Home button. The report also indicates that HTC Ocean is expected to come with a better camera with advanced HDR features for better picture quality with modes such as HDR+ with“Real-Time HDR scene detection” , Smart Video Zoom, 3D Audio and Hi-Res Recording functions. 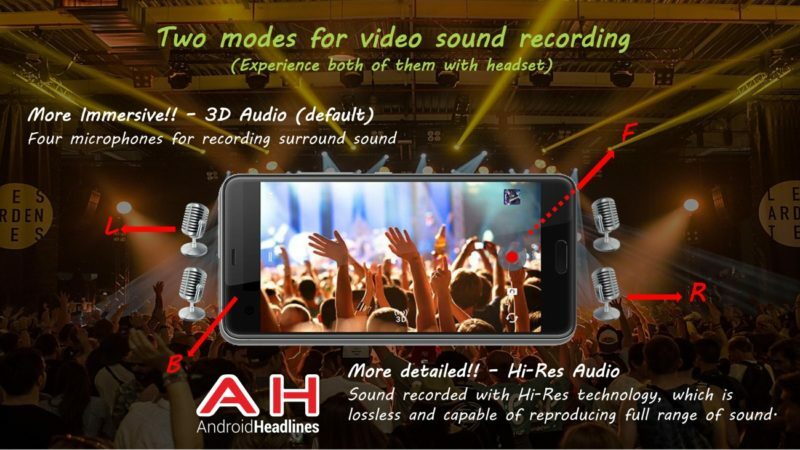 The phone integrates four microphones for recording sound for good audio quality for videos, and has two different audio recording modes 3D Audio and the Hi-Res Recording. But as with any other rumor or leak, take this with a pinch of salt. Stay tuned at Androidpure and we will keep you updated.